That’s the title Yury Vasiliev gave to an amazing interview with Topalov after the final game of the World Championship match in Sofia. Topalov reveals what went through his mind when he committed consecutive blunders on moves 31 and 32, while Anand also gives his views on the match. In fact we weren’t caught out. After all even in the “Lasker” there are a few lines. The problem was that the playing time was coming to an end… Anand let me escape only in the 9th game. Whereas I let him slip in the 3rd, 5th and 10th. He took almost the maximum from the positions where he had an edge. Except the 9th game. That is he had a chance to win one extra game, which he didn’t manage to do. While from the three games I mentioned I had the chance to win one more. And moreover easily. So you’d built up anger and hurt? And that’s known to be a lottery? It’s not that it’s a lottery… But simply in my life, to be honest, I’ve only ever beaten Ruslan [Ponomariov], when he was 15. In all the other tie-breaks I’ve lost. No, I don’t think that played any kind of role. It was suicide. The thing is that when he played 29…e5 I decided to reply 30. e4. Of course I saw that his next move would be 30…f5. But, I thought, when he does that I’ll have a think: should I play 31. Nd2 or take. And when he instantly played 30…f5 at that moment I had more than half an hour left, but for some reason I immediately played 31. exf5. Of course, it was suicide. But don’t you find it strange: a match for the world title, the deciding game, and you commit chess suicide. But I see no difference between losing the way I lost and losing in the tie-breaks. Yes, I could. But I knew for an absolutely certainty that Anand would never lose SUCH positions. It was the type of position that he’s never lost in his life. And in the tie-breaks if, let’s say, I played out of my skin, then I could only hope for a 2:2 score. And then – blitz! But my preparation in general hadn’t included either blitz or rapid. No training games at all. I’m not claiming that I completely dismissed blitz, but I considered it very unlikely that it would come to blitz. Yes. Partially conscious suicide. But you have to give him credit – for the first time in the match he got out of the opening with a normal position. Was it a surprise for you that Anand played Kramnik’s openings? But he started with the Grunfeld. I think he had a different plan, but they had to adapt as they went along. I expected the Catalan, of course, but you never know exactly which Catalan. I had a couple of ideas… It was also necessary to prepare a whole range of openings for 1. e4 and other first moves. And what can you say about the “Elista endgame” with the bishop on g6 in the Slav, which you only broke down with some help from your opponent? You mean white gets a large advantage? I can see in your face, from the glint in your eyes, that you’re not disappointed with the match result at all. Is that true? I’m disappointed that I didn’t take my chances. It’s a law of sport. Let’s say, endgame technique isn’t my cup of tea. But even with my technique I should have taken more points than I got in those “Elista endgames”. It’s unforgivable – not to win one of the 3rd, 5th and 10th games. For a match for the world title it’s ridiculous. That gave Anand chances to maintain equality. 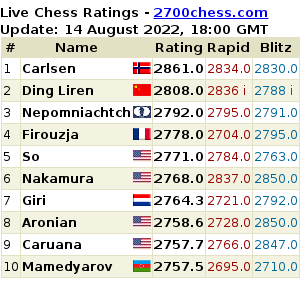 A man without openings managed to hold equality from the 2nd to the 11th game! Did your team have a lot of work during the match? Yes. During the match we had problems with black. I didn’t get the type of position I wanted to get. I was always under pressure. Until the 4th game we managed to set Topalov problems with white, but after that we also couldn’t get an edge with white. My team and I had to do a lot of work in order to improve our preparation and deal with problems. …if the [12th] game had gone differently and you’d had to play tie-breaks would you have considered yourself the favourite in rapid play? Or were you still worried about the tie-breaks? Yes, I’ve had good results in rapid chess. But I got them in tournaments. Here, with the stakes so high, I don’t think I’d be favourite. Four games in a row with the stakes so high… No, I don’t think I was the favourite at all. At the same time I wouldn’t say I feared them. My mood was: what will be will be. If I have to play rapid chess, I’ll play rapid chess. Going back to what actually happened, was it a great surprise for you in the 12th game? When did you know that you were going to win the game and match? When I played 29…e5 I already saw that I was better. When he took on f5 I could see that he was taking a big risk, but I still had some doubts. But when I managed to find the move Qe8 I knew that I’d win the game and match. […] Gata Kamsky and Emil Sutovsky told me that when they were preparing for games with Topalov in last year’s match in Sofia they’d put on music and listen to various Russian groups. What music did you listen to during preparation? I’ll ask one “philosophical question”. My Moscovite friend, Ravi Abhyankar, who you know well, told me that for the Brahmins, to whom you belong, a loss is not sorrow and a win is not joy. The main thing is peace of mind. If you hadn’t won the match would you have managed to maintain that peace of mind? In general, of course, Ravi is right. If I’d lost the match I’d have been sad, but nevertheless my life would have gone on. But having won the match, I’m really glad. Both comments are very interesting. One little clarification: It’s true that Anand belongs to the Brahmin community. But it is not the community that has this philosophical attitude. It’s rather the Vedanta school of thought:we should treat both joy and sorrow with equanimity. This is rather similar to Stoicism.